Sergei Vasilievich Rachmaninoff (Russian: Сергей Васильевич Рахманинов, Sergej Vasil'evič Rahmaninov, April 1, 1873 – March 28, 1943) was a Russian-born composer who later in life became an American citizen. As a performer, composer, and conductor, Rachmaninoff is remembered as one of the true artistic geniuses of the late nineteenth and early twentieth century era. While his reputation as a composer only came later in life, Rachmaninoff's skill as pianist was well-known and highly respected throughout his life; he often performed his own works as soloist. He was one of the greatest pianists of his generation, having legendary technical facilities and rhythmic drive, and his large hands were able to easily cover an interval of twelfth on the piano. His piano concertos are among the most demanding ever composed, as he sought to challenge both himself and other pianists to greater heights. Many recordings were made by the Victor Talking Machine Company recording label of him performing his own music as well as works from the standard repertoire. His compositions include, among others, four piano concerti, three symphonies, two piano sonatas, three operas, a choral symphony (The Bells, based on the poem by Edgar Allan Poe), a setting of the Vespers, Rhapsody on a Theme of Paganini, 41 Preludes and Etudes, Symphonic Dances and many songs. Most of his pieces are in a late Romantic style akin to Tchaikovsky, although strong influences of Chopin and Liszt are apparent. Further inspiration included the music of Mily Balakirev, Mussorgsky, Nikolai Karlovich Medtner (whom he considered the greatest contemporary composer) and Adolf von Henselt. Due to these influential composers, many of Rachmaninoff's symphonic works are in the modern idiom that corresponds with his twentieth century contemporaries. His life as both a performer and as a composer who raised to new heights the skills of others reveals the ideal of instruction by example. This way is best for elevating others, including as the way to raise up people in their spiritual and social responsibilities. Sergei Rachmaninoff was the spelling the composer himself used while living in the West throughout the latter half of his life, including when he became a United States citizen. However, alternative transliterations of his name include Sergey or Serge, and Rachmaninov, Rachmaninow, Rakhmaninov or Rakhmaninoff. 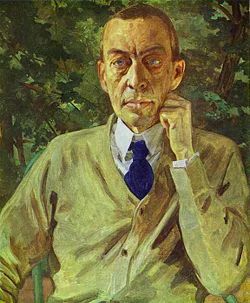 Rachmaninoff was born in Semyonovo, near Novgorod in north-western Russia, into a noble family which had been attested in the service of Russian tsars since the sixteenth century. His father, an army officer and his mother, an heiress, were both amateur pianists, and he had his first piano lessons with his mother at their family estate at Oneg. His parents soon noticed his outstanding talent on the piano. Because of financial difficulties due to his father's gambling, squandering the family fortune, they moved to Saint Petersburg, where Rachmaninoff studied at the Saint Petersburg Conservatory before moving to Moscow. There, he studied piano under Nikolay Zverev and Alexander Siloti (who was his cousin as well as a former student of Franz Liszt). He also studied harmony under Anton Arensky, and counterpoint under Sergei Taneyev. It should be noted that in his younger days, Rachmaninoff was found to be quite lazy, failing most of his classes and spending much time skating because his schooling was not challenging enough. Sergei's father deserted the family when he was nine years old. Eventually, it was the strict regime of the Zverev home (a place for many young musicians, including Scriabin) that instilled discipline in the boy. Already in his early years he showed great skill in composition. While still a student, he wrote the one-act opera, Aleko (for which he was awarded a gold medal in composition), his first piano concerto and a set of piano pieces, Morceaux de Fantaisies (Op. 3, 1892), including the popular and famous Prelude in C-sharp minor. After 40 years of performing it as an encore at his piano recitals due to popular demand, he came to detest the piece. Rachmaninoff confided his desire to compose more to Zverev, requesting a private room where he could compose in silence, but Zverev saw him only as a pianist and severed his links with the boy. After the success of Aleko however, Zverev welcomed him back as a composer and pianist. His first serious pieces for the piano were composed and performed as a student at the age of 13 during his residence with Zverev. In 1892, at age 19, he completed his Piano Concerto No. 1 (Op. 1, 1891), which he revised in 1917. Rachmaninoff's Symphony No. 1 (Op. 13, 1896) premiered on March 27, 1897, but was torn apart by critics (including a particularly vitriolic review by Cesar Cui, who likened it to a depiction of the seven plagues of Egypt, written for a conservatory in hell). Some have suggested that this was largely due to the conducting of Alexander Glazunov, who disliked the piece and under-rehearsed it; Rachmaninoff's wife later suggested that Glazunov may have been drunk. This disastrous reception, coupled with his distress over the Eastern Orthodox Church's objection to his marrying his cousin, Natalia Satina, led to a nervous breakdown. He wrote little music over the following years, until he began a course of autosuggestive therapy with psychologist Nikolai Dahl, an amateur musician himself. Rachmaninoff quickly recovered his confidence, resulting in the composition of the Piano Concerto No. 2 (Op. 18, 1900–1901), which was dedicated to Dr. Dahl. The piece was very well received at its premiere at which Rachmaninoff was soloist, and remains one of his most popular compositions. Rachmaninoff's spirits were further bolstered when, after years of engagement, he was finally allowed to marry Natalia. They were married by an army priest in 1902, and their union lasted until the composer's death. After several successful appearances as a conductor, Rachmaninoff was offered a job as conductor at the Bolshoi Theatre in 1904, although for political reasons he was forced to resign two years later. In 1908, he moved to Italy, and later to Dresden, Germany, while waiting for the political situation in Russia to normalize. Rachmaninoff made his first tour of the United States as a pianist in 1909, an event for which he composed the Piano Concerto No. 3 (Op. 30, 1909). This successful tour made him a popular figure in America, and he emigrated to New York following the Russian Revolution of 1917. After his departure his music was banned in the Soviet Union for several years. His compositional output slowed to some degree, partly because he was required to spend much of his time performing to support his family, but mainly due to homesickness; he felt that when he left Russia, it was as if he had left behind his inspiration. Nevertheless, his Rhapsody on a Theme of Paganini, one of his best-known works, was written in Switzerland in 1934. He went on to compose his Symphony No. 3 (Op. 44, 1935–1936) and the Symphonic Dances (Op. 45, 1940), his last completed work. He fell ill during a concert tour in late 1942, and was subsequently diagnosed with advanced melanoma. His last recital, given in February 1943, prophetically featured Chopin's Piano Sonata No. 2 in B flat Minor, which contains the famous funeral march. He died on March 28, 1943, in Beverly Hills, California, and was interred in Kensico Cemetery in Valhalla, New York. Rachmaninoff wrote five works for piano and orchestra: 4 concertos and the Rhapsody on a Theme of Paganini. Of the concertos, which Rachmaninoff considered as "piano symphonies," the Second and Third are the most popular, and are considered to be in the upper echelon of the virtuoso Romantic piano concerto literature. The Third, in particular, has the reputation as the most difficult concerto in the entire repertoire, with a record for the most notes notated and played per minute, and is a favorite among virtuoso pianists. The Second is arguably more difficult, depending on which school of technique a pianist has studied. It was composed at the same time as his Suite #2 and Sonata for Cello and Piano. Interpretations considered "definitive" of the Third concerto include those by Vladimir Horowitz, a friend of Rachmaninoff; Byron Janis, the only student acknowledged by Horowitz; and Rachmaninoff's own recording. Other noted interpreters of his music include Vladimir Ashkenazy, Benno Moiseiwitsch, Sviatoslav Richter, and Van Cliburn. Works for piano solo include the Preludes, Op. 23 and 32 which, together with the Prelude in C sharp minor, Op. 3/2, from Morceaux de Fantasie, traverse all 24 major and minor keys. Especially difficult are the Etudes Tableaux, which are literally very demanding study pictures. There are also the Moments Musicaux, Op. 16, and the Variations on a Theme of Chopin, Op. 22. He wrote two piano sonatas, both of which are monumental works and fine post-romantic examples of the genre. Rachmaninoff wrote three symphonies, the Symphony No. 1 (Rachmaninoff) in D minor, a monumental failure. He tore up the score and for many years it was believed lost; however after his death, the orchestral parts were found in the Leningrad Conservatory and the score was reconstructed, leading to its second performance (and American premiere) on March 19, 1948 at an all-Rachmaninoff concert marking the fifth anniversary of the composer's death. The Symphony No. 2 and Symphony No. 3 were much more popular. Other orchestral works include The Rock, Capriccio on Gypsy Themes, The Isle of the Dead, and the Symphonic Dances. Rachmaninoff wrote two major choral works: the Liturgy of Saint John Chrysostom and the All Night Vigil, or Vespers. The Bells, a work for choir and orchestra, is based on the translated poetry of Edgar Allan Poe; its four-movement program signifies the circle of life: youth, marriage, maturity, and death. The Vespers and The Bells are widely considered to be some of his finest works. His chamber music includes the Trio Elegiaque, a piano trio written in memory of Tchaikovsky. Also well known is the Cello Sonata, which is really more aimed to show off the capacities of the piano than those of the cello. Nevertheless, it is a very finely crafted work. Rachmaninoff's style is fundamentally Russian: his music shows the influence of the idol of his youth, Tchaikovsky. His harmonic language appeared to expand above and beyond that of Tchaikovsky, and his pianistic stylistics made his piano works very difficult to perform, due to a high level of the mastery of many grand and virtuosic techniques. Performing a Rachmaninoff piano concerto is akin to practicing extreme calisthenics on the keyboard. Rachmaninoff's frequently used motifs include the Dies Irae, often just the fragments of the first phrase: this is especially prevalent in The Bells, The Isle of the Dead, the Rhapsody on a Theme of Paganini, and the First and Second Symphonies. The Second Symphony, in particular, has a marvelous and little known occurrence of the Dies Irae: in the second movement he uses it as the basis for the harmony in counterpoint to one of his archetypal soaring melodies. Also especially important is the use of bell-like sounds: they occur in many pieces, most notably the Second Piano Concerto and the B minor prelude. It is no coincidence that he wrote a cantata entitled "The Bells." He was also fond of Russian Orthodox chants. He uses them most obviously in his Vespers, but many of his melodies found their origins in these chants. The opening melodies of the Third Concerto and the First Symphony are both derived from chants. In scherzo-like movements, he often used a modified rondo form, usually opening with a light, swift rhythmical idea, then supplying a breath of fresh air in the form of a beautifully romantic melody, ending in a similar scherzo-fashion. Examples of this may be found in the last movement of the Second Concerto, the scherzo of the Cello Sonata, and the scherzo of the Second Symphony. Rachmaninoff had great command of counterpoint and fugal writing. The above-mentioned occurrence of the Dies Irae in the Second Symphony is but a small example of this. Very characteristic of his writing is chromatic counterpoint. His later works, such as the Piano Concerto No. 4 (Op. 40, 1926) and the Variations on a Theme of Corelli (Op. 42, 1931), are composed in a more emotionally detached style, making them less popular with audiences despite their striking originality. In these later compositions, Rachmaninoff sought a greater sense of compression and motivic development in his works at the expense of melody. Nevertheless, some of his most beautiful (nostalgic and melancholy) melodies occur in the Symphony No. 3, Rhapsody on a Theme of Paganini, and Symphonic Dances, the latter of which is considered his swan song and has almost metaphysical references to the Alliluya of the Vespers and the first theme of his Symphony No. 1. 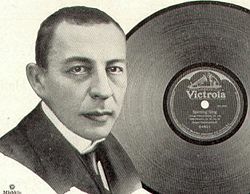 Rachmaninoff made his first recordings for Edison Records on their "Diamond Disc" records, since they claimed the best audio fidelity in recording the piano at the time. Rachmaninoff did not consider himself a great pianist and believed his own performances to be variable in quality; he therefore requested to personally approve any recorded performances to be commercially issued. Despite this, the Edison Company issued multiple alternative takes of Rachmaninoff's recordings, a common occurrence in the gramophone record industry at the time, possibly for reasons of simple carelessness or because of the ease of mass production of records from multiple masters. Rachmaninoff was so angered by this that he left Edison and subsequently started recording for the Victor Talking Machine Company and its successor, RCA Victor. The company was pleased to abide by Rachmaninoff's restrictions, and proudly advertised him as one of the great artists who recorded for the Victor Company. Rachmaninoff also made a number of piano rolls; initially disbelieving that a roll of punched paper could provide an accurate record, he was invited to listen to a master roll of his first recording in 1919 for the Ampico company. After the performance, he was quoted as saying "Gentleman — I, Sergei Rachmaninoff, have just heard myself play!" He continued to record for Ampico until around 1929. Rachmaninoff's music has been used often in films, especially themes from his second and third piano concertos, and the eighteenth variation of the Rhapsody on a Theme of Paganini. The soundtrack of the 1945 film Brief Encounter prominently features the second piano concerto, as interpreted by Eileen Joyce. In the 1955 comedy The Seven Year Itch, the protagonist (played by Tom Ewell) fantasizes about seducing Marilyn Monroe's character by playing the second piano concerto. The 1953 film The Story of Three Loves, directed by Vincente Minnelli, features the Rhapsody on a Theme of Paganini; the same piece is featured extensively in the 1980 drama Somewhere In Time and the 1993 comedy Groundhog Day. In the 1996 film Shine, the pianist David Helfgott is obsessed with Rachmaninoff. Helfgott, played by Geoffrey Rush, enters a piano competition, choosing to play the third piano concerto despite the warnings of a teacher that the piece may be too demanding; Helfgott completes the piece only to suffer a nervous breakdown. In the 2006 movie The Devil Wears Prada, the twin daughters of Meryl Streep's character play Rachmaninoff at a recital. In the 2010 movie Our Day Will Come by French director Romain Gavras, the Prelude in C-sharp minor is sampled, particularly in the trailer. The protagonist of the 2011 film Limitless is shown playing an excerpt from the Prelude in C-sharp minor. In addition, Rachmaninoff's melodies have often been referenced by composers of American popular music. The song "I Think of You" from Frank Sinatra's album "Where Are You?" (1957) is based on the second theme in E-flat major from the first movement of Rachmaninoff's Piano Concerto No. 2. Frank Sinatra's 1946 single "Full Moon and Empty Arms" is based on another theme from Rachmaninoff's Piano Concerto No. 2. Eric Carmen's first two solo singles, "All by Myself" and "Never Gonna Fall in Love Again," were based on melodies from Rachmaninoff's Piano Concerto No. 2 and Symphony No. 2, respectively. ↑ Mary Elizabeth Raines, Marilyn Monroe, Rachmaninoff, and...HYPNOSIS? (Academy for Professional Hypnosis Training, 2010). All links retrieved September 10, 2013. Rachmaninoff's Works for Piano and Orchestra: Analysis of Rachmaninoff's Works for Piano and Orchestra. This page was last modified on 21 September 2013, at 22:35.